Brian Roberts Out for 3 Weeks; Who Bats Leadoff? Once again, the Birds are faced with the reality of life without their leadoff hitter, Brian Roberts. While hopefully his absence will not be nearly as prolonged as it was in 2010, when he played just 59 games, Roberts is out for at least the next three weeks due to concussion-like symptoms. This leaves the O’s in the unenviable position of needing to replace their man at the top of the order for the foreseeable future. While it is true that the “leadoff hitter” really only comes up once per game – the first time through the lineup – it is still a crucial spot in the order, one that sets the table for the 2, 3, and 4 hitters. Roberts is a prototypical leadoff hitter – one that has extended at bats, gets on base at a high rate, and can steal bases. For his career, Roberts has a .281 batting average and gets on base at a .353 clip while slugging .416. He has stolen 274 bases and been caught 67 times (80%). From 2007-2010, Brian averaged 4.12 pitches seen per plate appearance. His numbers were down in 2011 (.221/.273/.331, 6/7 stealing. 3.85 P/PA), but he was showing signs of getting it together in May. Looking at the current roster, the Birds really have nobody that compares to Brian. Of the six games that Roberts has missed so far, Pie has hit leadoff in three of them. In his two-plus years in B’More, Pie has a batting average of just .268, a lowly on-base percentage of .309, and a .416 slugging %. He has stolen only seven bases, while being caught five times (58%). This year, he is at .250/.250/.304. That’s right, he has yet to draw a single walk in 64 plate appearances. During his time in B’More, Pie averages just 3.43 pitches per plate appearance. Pie has speed, but that’s about it. Not nearly the eye or plate discipline to be a viable leadoff hitter. Andino has hit leadoff in the other three games that Roberts has been out. Robert has managed a .246/.310/.326 line during his two-plus years in Charm City. He has six steals, and has been caught four times (60%). In 2011, despite a hot start, Andino has cooled off to the tune of .264/.368/.319. He has walked 14 times in 108 plate appearances. The utility infielder averages 3.67 pitches per plate appearance since he came to the O’s. Based on these numbers, Andino is a better option than Pie for the leadoff spot. However, I have another candidate I wish Buck Showalter would consider. Nicky Mark has never hit leadoff (that I know of – feel free to correct me), but I think he would be a great candidate to replace Roberts short-term. He is a career .295/.365/.456 hitter, with 47 steals in 74 attempts (73%). He has never developed into the 20+ home run guy that many of us envisioned he would, but Markakis has great gap power, as evidenced by his 40+ doubles in four straight seasons. Obviously, Nick has been in a funk in 2011, managing just a .259/.325/.346 line, with only four doubles so far. I blame this partly on my observation that Nick seems to be hacking a lot more than normal. This is backed up by his P/PA, which is at its lowest since his rookie season (3.71 in 2011, career 3.85, 2010 – 4.04). Perhaps moving Nick into a spot in the order where there is more pressure for him to get on base – as opposed to drive in runs, as in the 3-slot – would get him back to his old self of seeing a lot of pitches and taking counts deeper. His career walk rate is 9.7%, but that number is down to just 7.3% this season. A dark-horse candidate I’ve heard thrown out there by some on talk radio is Hardy. J.J. has a career line of .262/.323/.423. While not much of a base stealing threat (6/13 career), his OBP and career walk rate (8.1%) make him worth a look. He has only 77 PA so far in 2011, during which he has been at .239/.316/.403. Surprisingly, his career P/PA is higher than even Nick’s, at 3.88. 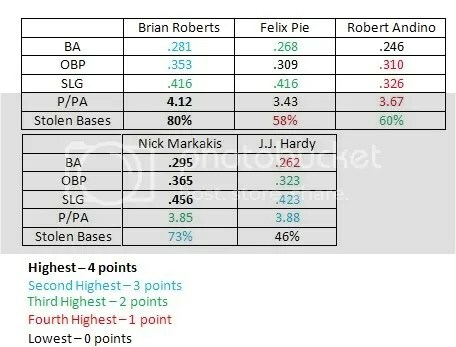 While it could be obviously stated that yes, Brian Roberts, J.J. Hardy, and Nick Markakis are clearly superior baseball players to Felix Pie and Robert Andino, I tried to choose metrics that most closely matched what I want in my leadoff hitter. With that in mind, I’ll go ahead and give the nod to Andino over Pie based on his superior OBP and P/PA (in 2011 specifically, not necessarily since being in Baltimore as shown above). Given the options of Andino and Pie, my vote is for Robert Andino. What do you think? Who should assume Brian Roberts’ leadoff duties in his absence? This entry was posted on May 25, 2011 at 9:57 am and is filed under Orioles. You can follow any responses to this entry through the RSS 2.0 feed. You can skip to the end and leave a response. Pinging is currently not allowed.